“I walked through the road of life and had fallen into a great ditch. The ditch was filled with depression, discouragement, and sin. As I lay in that ditch, Mohammed came along and said, ‘It’s your fault you’re in the ditch. You offended Allah, and this is your just punishment.’ Then Marx came by and said, ‘You’re in the ditch because of class warfare. You must revolt.’ But after the government changed, I was still in my ditch. Then Buddha came along and said, ‘You’re not really in that ditch. You just think you’re there. It’s all an illusion of the mind. Be at peace.’ Then Confucius came by and said, ‘Here are the 10 steps of self-attainment by which you can get out of your ditch. If you will struggle, you will climb out eventually.’ But as much as I struggled and strained, I couldn’t get out of the ditch, because it was too deep. Sinking to rise no more. From the waters lifted me. Refrain: Love lifted me! Love lifted me! Matthew 14:29-31a — Peter got down out of the boat, walked on the water and came toward Jesus. 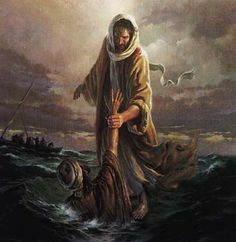 But when he saw the wind, he was afraid and, beginning to sink, cried out, “Lord, save me!” Immediately Jesus reached out his hand and caught him. Psalm 40:1-2 — I waited patiently for the Lord; he turned to me and heard my cry. He lifted me out of the slimy pit, out of the mud and mire; he set my feet on a rock and gave me a firm place to stand. Acts 16:31a — Believe in the Lord Jesus and you will be saved. God gives to man the trees of the forest and the iron in the ground. He gives man the brains to make an ax and nails from the iron, and the energy to cut down the tree, the skill to fashion the wood into beams. God gives man the cleverness to make a handle from the wood, and head from the iron, and combine it into an effective hammer. Then man takes the beams, the nails, and the hammer and he nails God to the cross — where God willingly stretched out His arms, dying on the cross to take the guilt and penalty man’s sin deserved, to make a new, restored relationship between God and man possible.